Hi kids! Working on a report, or just here for fun? 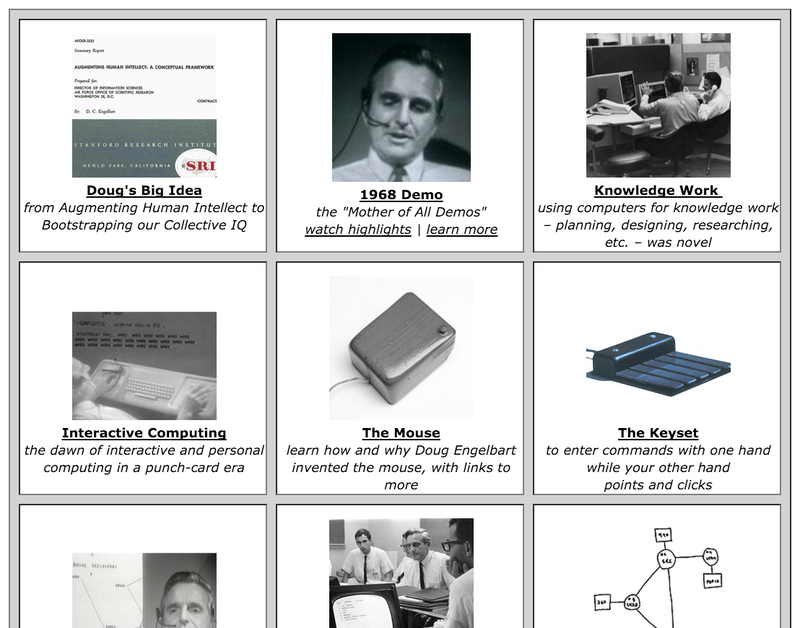 Come in and learn about Doug Engelbart, who was a computer pioneer as well as a grandpa. You can read about his computer stuff below. As far as being a grandpa, he would always make up stories about a really intelligent, really little magical dog named Fifi who can make himself really tiny or even invisible and fly around in a miniature spaceship and cause mischief. He especially liked the mischief part. Doug was a kid once too (and he swore he never stopped being one!). He used to do tricks on his bicycle and tease his sister and stuff. He grew up on the edge of a little creek near the woods up in Oregon where he liked to go exploring. If you had met him he would have probably shaken your hand and then said 'Hey, let go of my hand!' and no matter how hard you tried to let go you just couldn't seem to and he would just keep shaking your hand. One way to get him to let go of your hand was to ask really nice 'Can you take off your thumb?' and he just might do this magic trick with his thumb. 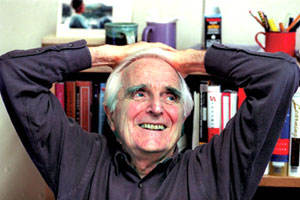 The main thing to know about Doug Engelbart is not that he invented the mouse. The first main thing to know is that he started out trying to find better ways for people to work together on big problems so we could make the world a better place to live in. So kids all over the world can feel safe and happy and grow up to make the world even better. He wondered "How can we get really good at solving problems like world hunger, pollution and global climate change, war, making schools better places to learn, and so on?" He started asking "What would it take? What would help? How can I help make it happen? What would it be worth to the world if we could get really really good at solving big complex urgent problems?" and this started his whole career, and this is what our Institute is still working on today. Since he had studied in college to be an engineer, and had been reading about the first computers, and had been trained on fancy new stuff called radar in World War II, he figured he could put that all together into a way that problem solvers could sit at "workingstations" and fly around their information space working on solutions together. That was in the 1950s. The second main thing to know is that, before he started experimenting in a laboratory and building his computer stuff, he worked out a strategy for how he was going to do it. He called this his bootstrapping strategy, where he and his programmers and engineers would build the computer in his lab, and they could all use it immediately to help their teamwork in the lab. After all, they were working together on a complex problem – how to build a revolutionary computer system – so if it worked really well for them, it should work for anybody working on any complex problem. And then they got people outside their laboratory to start using it so they could report back their ideas for making it better, and then got them working together on the question of how to help other people get started, and got it spreading out from there. Because of Doug's vision and strategy, his lab had this really fast learning curve, and out of that they created more innovations than probably any other computer lab ever has. Also, for Doug it was never about computers or being an inventor, it was always about people and information linking together in new ways, and computers were just the vehicle for being a pioneer in that new territory. He was not about inventing gadgets, he was about unleashing human potential. Doug Engelbart and the Mouse - Nickelodeon Maga­zine inter­viewed Doug Engel­bart so kids could learn about how the mouse was invented (posted on Super­Kids site). Check it out! Visit our Online Exhibits - so much more to explore about what all he pioneered! Father of the Mouse - (actually he was the father of 4 kids and 9 grand­kids, but hey) this is one of our many exhibits, about how he invented the mouse and why he wanted to in the first place, plus a link to a short video inter­view of him explain­ing it himself. Want to see a demo? Check out Doug's very famous 1968 demo on YouTube! To really appreciate this, you have to under­stand that at that time almost everyone else working on compu­ters thought it was all about compu­ta­tion - like computers are to compute stuff like giant calcu­la­tors working hard mathe­matical equa­tions for people working in labs; you get in line for your turn to feed your data and instruc­tions into a computer, and crunch, crunch, crunch, for hours and hours, it would work those calcu­la­tions, and come back with results punched out on some 'punch cards' or 'paper tape' and then the computer would forget you ever asked because it had hardly any memory or disk space. And next time you needed something you fed in your punch cards from last time and gave more instruc­tions and so on. And here is Doug Engel­bart sitting there using a computer through a display monitor (!) and the computer was just sitting there responding to every little thing he clicked or typed (!) and he's using it for writing stuff (!) and when he edits you instantly see the changes on the screen POW (!). This is the first time the world saw his inventions like the mouse and the keyset, hyper­text, and collaboration. Check out where he has a 'bug fight' with his co-worker on Clip 25 at the Stanford MouseSite! New! See our Student Showcase - selected projects by other students inspired by Doug's work. New! How Doug Engelbart taught kids to ride a bike (without training wheels) - do you know why your bike doesn't fall over while you're riding it? Doug figured it out and found a cool way to teach others. Timeline for Kids - this is a timeline of computer history from "Soft Schools", where you'll see 1963 yours truly Doug Engelbart. Actually he started on his work in 1959, published a huge report on his ideas in 1962, had his first working system in operation with a display workstation by 1963, invented the mouse in 1964, and kept growing his team of researchers and expanding on what his lab could do, and then gave the big demo in 1968. He kept doing this research and development for another 10 years at SRI, and then switched over to making it commercially available to large government organizations and companies interested in experimenting with new ways of working together. This was 1978, still way before the Macintosh computer, when half the people believed you could only learn how to use a computer if you were a math wiz, and the other half believed that computers in the office should only be used by secretaries because professionals should not be expected to type on a keyboard. And most all of them believed that computers were only for grown ups. So all along, Doug and his staff were way ahead of their time! And we are still working away on his ideas for how to get people to work together in better ways to solve big problems around the world. Internet History - this is a cool timeline beginning with ... the telegraph !?! ... When you get to 1969 scroll down you'll see SRI - Stanford Research Institute - that's Doug Engelbart's lab, the second computer to be connected to the first computer network (way before the internet). The reason they hooked him up so early on is because, of all the labs they were planning to hook up, his lab had volunteered to run a Network Information Center on his computer where all the users coming online after that could find out what computers were hooked in and what you could use them for. They even published names of all the users and their email addresses so you could communicate with anyone on the network. Can you imagine how thick that directory of users was printed out? Try half a page! It grew, of course, until now it would be crazy to print out a list of all the email addresses on the internet! Also, in those days we didn't have to worry about spam or hackers or computer viruses or anything like that. And most of the early users of the network logged in from their handy dandy teletypes since display technology was very uncommon, very expensive back then. Our Library - check out his biographical sketch, and on the right there are links to his historical involvement in the mouse, hypertext, the internet etc. for more in-depth background information. HyperScope Tutorial - this adds some zooming buttons to your browser and lets you zoom around, jump around, and get different views of the webpage. It's a bit buggy, but shows first hand some of the browsing features that Doug would like to see become as widespread as the mouse. "The rate at which a person can mature is directly proportional to the amount of embarrassment he can tolerate." 101 gadgets that changed the world, Belfast Telegraph, 2007. Scroll to item 55 for a mention of Doug Engelbart's invention of the mouse. Can you guess who this is shaking Doug's hand? 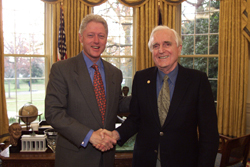 President Clinton – when Doug was awarded the President's Medal of Technology for his lifetime achievements in Nov. 2000. And yes, Doug did let go of his hand, and without even doing the magic trick with his thumb. 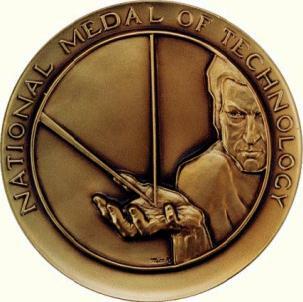 close up picture of the actual Medal and more info about it.